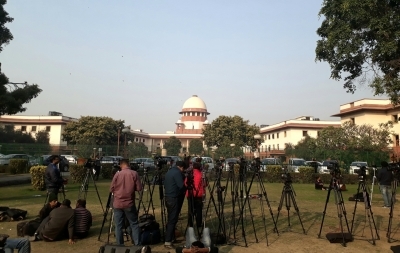 New Delhi, April 16 (IANS) The Supreme Court has issued a notice to Centre and Moser Baer India on a petition challenging the validity of Section 327(7) of the Companies Act, 2013, which maintains ambiguity on legitimate dues of workmen in the insolvency proceedings. The petition has been filed by Karamchari Union of Moser Baer India Ltd., a registered trade union. The petition claims that the union members have been denied legitimate dues - gratuity, provident fund, pension, and severance compensation - by the liquidator of the Moser Baer India citing Section 327(7) of the Companies Act, 2013. The petition said: "The explanation defined workmen's dues and it is specifically stated that it shall adopt the definition from Section 326 of Companies Act, 2013 which is pari materia to Section 529 (A) Companies Act, 1956. It is pertinent to mention that the term workmen's dues are not defined anywhere in the Insolvency and Bankruptcy Code apart from this explanation, therefore, this exclusion clause of the impugned sub-section creates an embargo on the grant of statutory rights of workmen when the company goes into liquidation." The said explanation in IBC defines workmen's dues and it specifically states that it shall adopt the definition from Section 326 of Companies Act, 2013 which is pari materia to Section 529 (A) of Companies Act, 1956. However, with the application of Section 326 excluded by Section 327(7), a void is created insofar as the definition of "workmen's dues' is concerned. The petition claimed, since the definition of workmen dues is not included in the Insolvency and Bankruptcy Code (IBC) and the non-exclusion of the application of Companies Act, a gap exists, regarding the definition of workmen dues under IBC. And, it has also created an ambiguity as it fails to define as to what will constitute "workmen's dues" under the IBC. The petition said that it is a violation of their right to livelihood under Article 21 of the Constitution, as the workmen is not entitled to their legitimate dues for the services rendered in the company for a long period of time. The petitioner sough court's intervention to strike down section 327(7) of the Companies Act, and also court's direction to leave the statutory claims of the "workmen's dues" out of the purview of waterfall mechanism under Section 53.